I’ve narrated a video on why big government is theoretically bad for an economy, another video looking at the empirical evidence on government spending and economic performance, and also a video on the growth-maximizing size of the public sector. But if you want to see a lot of what I said condensed into one video, here’s Dennis Prager talking about differences in how the left and right view government. The opening part of the video is interesting, though I suspect his descriptions only apply to philosophically motivated activists on each side. The part I want to focus on begins about 1:15, when he outlines seven adverse consequences of ever-growing government. I think he put together a very good list. Here’s my two cents on his seven points. 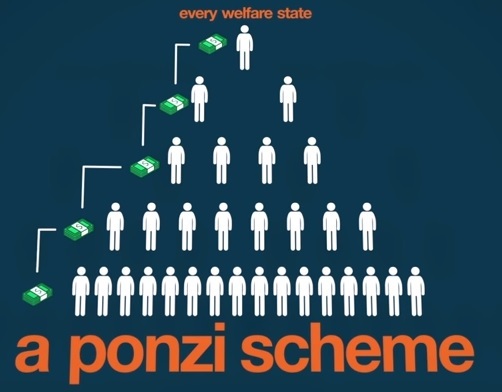 More Corruption – He points out that a government with lots of power and control will be very susceptible to misbehavior as interest groups and politicians figure out ways of scamming the system. Very similar to the message in one of my videos. Less Liberty – It is basically a tautology that ever-larger government necessitates a reduction in liberty. Not in a totalitarian sense, but taxes and regulations constrain the freedom of individual to earn and control income. Fiscal Crisis – He warns that big government is a recipe for fiscal crisis. I’m not sure if this has to be inevitable, but from a practical perspective, he is right. Demographic change and entitlements are a poisonous combination. Punitive Taxation – If government consistently expands faster than the productive sector of the economy, that almost certainly means ever-higher taxes, which ultimately will be self defeating because of the Laffer Curve. Unsustainable Debt – An expanding burden of government spending also will mean ever-higher levels of red ink, especially once the tax burden is so high that additional levies don’t produce much – if any – revenue. Totalitarianism – This is probably Prager’s weakest point. He’s right that bad people do very bad things when they control a government, but I suspect western nations will suffer societal breakdown rather that dictatorship. Dependency – He closes very strong with observations about the danger of luring people into reliance on government. This concern about the erosion of societal capital is much more important than most people think. This is the term I use to describe the unfortunate tendency of politicians to over-tax and over-spend until a society faces a crisis. For what it’s worth, I don’t think western nations necessarily will collapse (though some almost certainly will depending on the degree to which societal capital has been destroyed). But I will acknowledge that politicians generally don’t like taking the necessary steps to avert fiscal crisis. Which is one of the reasons I’m such a big fan of tax competition. I don’t want politicians to think that endless tax increases are a way of postponing the fiscal day of reckoning. Has there ever been a government in recorded history that did not grow hugely beyond original intentions? Has there ever been a government in recorded history that started big and then whittled itself away to almost nothing? Then why do you expect ours to do otherwise? Gov’t is an ever hungry behemoth. It will consume individual liberty and private capital at the fastest rate it is allowed. 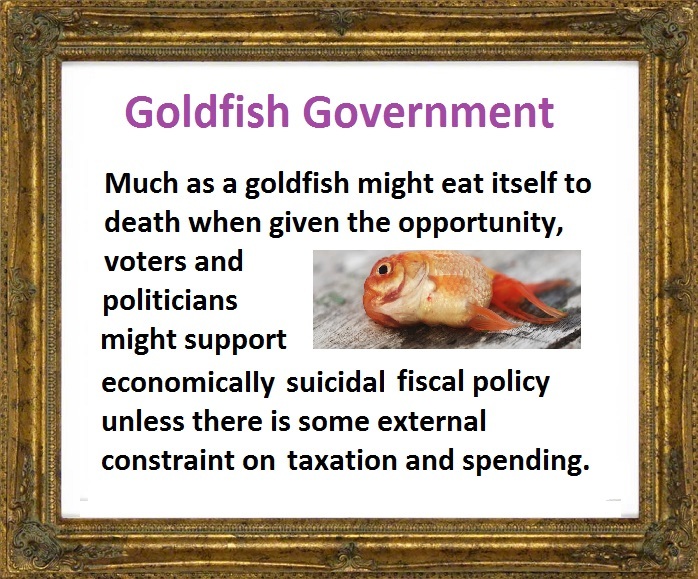 Your goldfish gov’t makes it sound less dangerous than it is. Yes, it’s destined to collapse but as Venezuela or USSR, i.e…quickly or after decades of misery? Then anarchy, chaos into which every one of our enemies and “friends” [or frenemies] will rush in and exploit to carve out their own profits off the corpse. Wise men, our founders to have crafted a blueprint for a form of gov’t that, if properly constructed, operated and maintained would keep the creature a good and faithful watchdog/protector that wouldn’t turn on those it was meant to protect and eat them. Sadly we have not properly operated nor maintained it.